The movie is 17 years old and I’ve seen it numerous times. It’s “Braveheart”. Remember the scene where William Wallace, immediately after the first battle, exhausted and out of breath, raises his sword and just yells, “Aaaahhhhhh!!!”. Then all of his followers go crazy and start cheering, “Wallace! Wallace!”. That gets me fired up every time. I once had the Braveheart theme on my phone and even wrote a bodyweight program called “Braveheart” that made a splash in the Turbulence Training world. I’m actually going to be improving that program soon… and it’s going to be awesome. Perhaps I was too fired up. About 3-4 weeks ago, I threw out my back (and to this day, I have no idea how… it slowly came on and eventually, I was crawling). Once I started to feel better, I started back into my workout regimen with patience and a minimal approach. That’s my minimal approach – great break-in before getting back to my full workouts this week, including a 10 x 10 DB Circuit on the agenda today. Enough about me – let’s talk about you and your questions…. Q: How do I get more out of my workouts while gaining muscle and losing fat? A: The workout part is easy – use big, compound movements and a structured program. With weight selection, be sure to use a weight that you can lift for just about 1 more rep than prescribed. That’s your needed intensity. 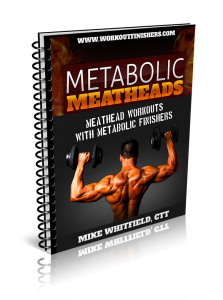 I have a program coming next week called “Metabolic Meatheads” that’s designed to put on muscle and lose fat at the same time. For calories – aim for a little above maintenance (about 200 calories) on workout days and about 200 calories less on non-workout days. That approach usually works and sometimes, just doing maintenance calories every day works just as well. Q: Would doing bodyweight exercises in the morning and resistance training at night help or hinder my results? A: I think that might be asking for overtraining. It really depends on the intensity of your bodyweight exercises. I prefer doing bodyweight exercises on off days (just keep the intensity moderate). Q: What is a “density finisher”? A: This is when you do as many rounds and sets as possible in a certain amount of time. I’ve been getting some really great feedback from readers and clients on this approach and I’ll be sharing more about this soon. That’s the approach I used in the Xtreme Fat Loss Finishers (the bonus you get with Ab Finishers). Q: How do I customize and individualize my program? Bodyweight Exercises – Add or reduce the number of reps and don’t be afraid to substitute. For example, not everyone can perform Spiderman Pushups. So, you can sub those for normal pushups. Q: How do I work out 5-6 days a week and include strength, cardio, power and stability? Of course, if you truly enjoy “cardio”, you can replace intervals with that. But don’t force it if you don’t like it. I prefer metabolic finishers. Q: I need minimum action with maximum results. What do you suggest? A: That’s easy – you can get results with a great diet and working out just 3 days a week. 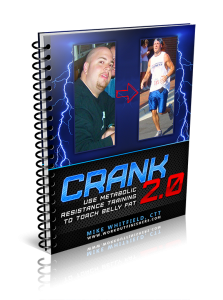 Use metabolic resistance training and finishers. If you want to get your core stronger as well, use ab finishers at the end of your workouts. Remember – the big and powerful (and heavier) moves should be done at the beginning of the workout when you’re fresh. If you need help structuring your workouts, try this post. Q: Do you have any recovery techniques? A: Shamefully, I didn’t approach my own recovery seriously until I threw my back out. Now, I’ve started to incorporate this circuit on my off days and I’ve been feeling great. And because elbow pain is typical doing crazy stuff like MRT and Finishers, there’s a way to manage it. I got my buddy Rick Kaselj to explain that right here. That dude is smart… so pay attention. AND… take your recovery seriously. So, gather round in a big circle kids… What did we learn today? Great information Mike. I think a ton of people get off track for one reason or the other with respect to training. The key is to get right back into it the right way. People need to understand that training is life long. Its a “marathon” and not a “sprint”. Many people who have an injury try and work through it and end up losing way more than a month, often times they put themselves out of the game for much longer. Be smart. Know when to shut things down for a brief time frame so that when you are good to go you can go full force. This can also be for things which are not purely physical and are mental in nature. I hope your back continues to heal well. Thanks Dan – I appreciate the feedback. And – well said! It’s certainly not a sprint.